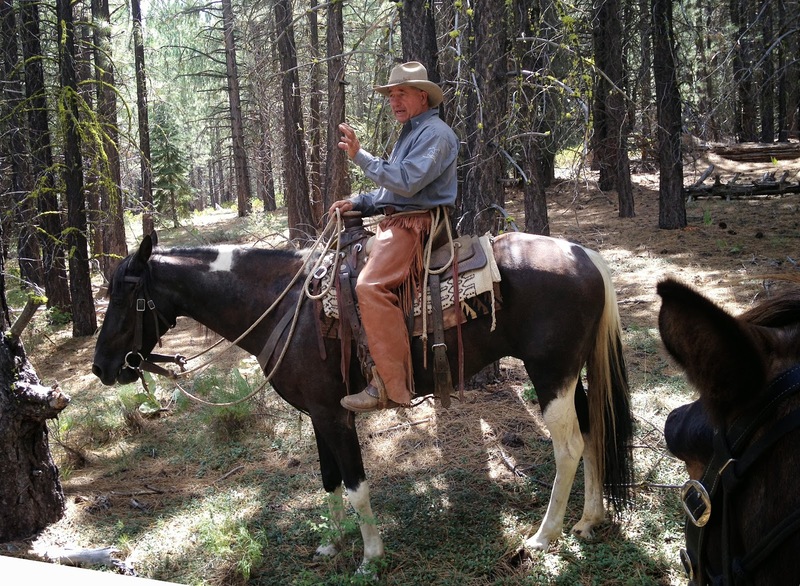 Day one of a Jerry Tindell riding clinic in the far reaches of Northern California. 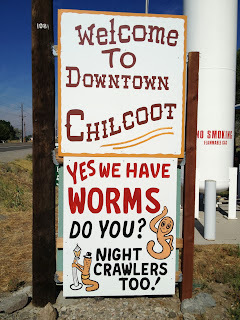 Wiggin's Trading Post that pretty much constitutes all of beautiful downtown Chilcoot, California. 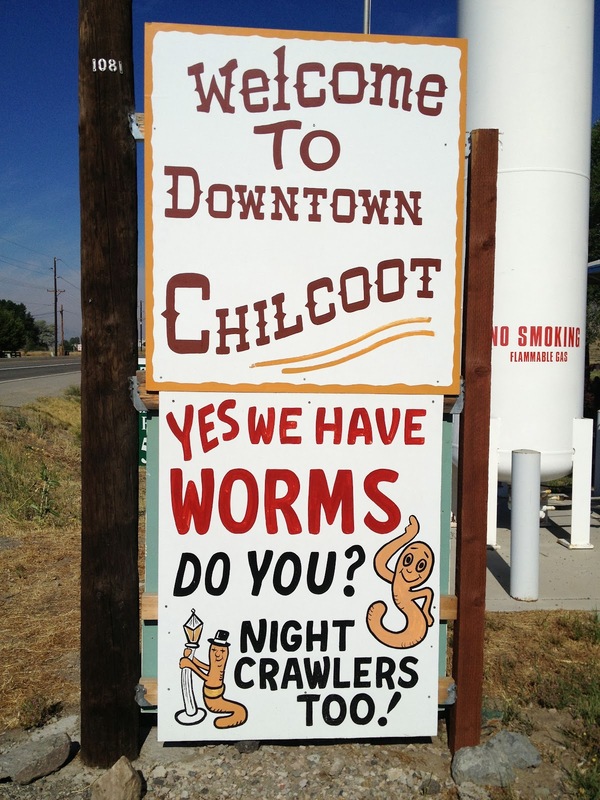 And if we needed worms, this was the place to go. But we didn't. We came to ride. Followed a map and signs down roads getting smaller and smaller, to a secret hide-away, a family treasure, a camp compound on the edge of the National Forest where our host and hostess have entertained family and friends for many decades. Tobe got his very own paddock made of pine poles, from which he could observe all the arrivals and the assortment of riders, mules and horses who gathered for the 3 day clinic. started off our sessions with a stern talk about taking responsibility for your own safety as well of that of your stock and those around you. 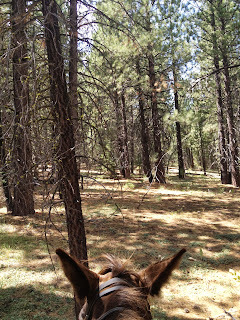 This was my first time riding back out in the woods after a big wreck last summer, hence this resuming the blog after a long hiatus. I was scared, yes, but determined to be a good student, and Tobe and I were all ears. We went out into a big meadow and starting warming up the animals. 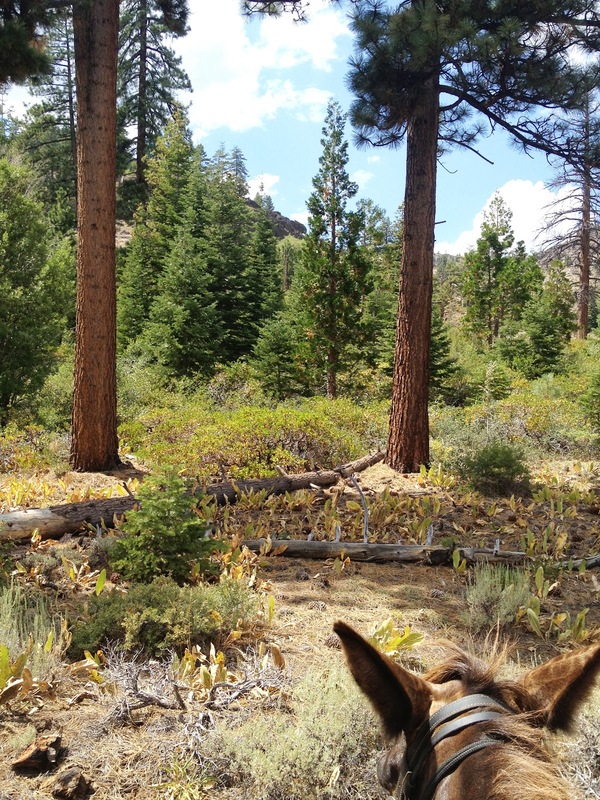 It was classic Californio country, pines on the horizon, scrubby grasses underfoot, and room to let the animals really move out and get a sense of rhythm. I was pretty scared, actually, although why I would expect Tobe the Mighty Mule to stumble and fall when mere horses were loping all around us I can't imagine. It took me a long time moving slow to get through some fear of getting hurt again. 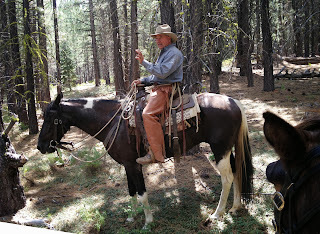 Jerry kept whizzing by loping this paint mare, and finally Tobe and I loped too. 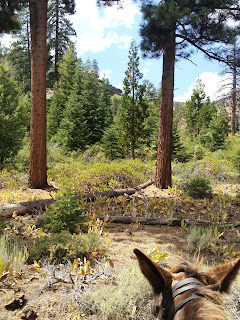 That's JT in the front, and then that wee creature top right is Tobe and I doing our best to speed up and stay connected. There really never is any question in my mind that Tobe is up to anything I ask of him, and he certainly does it all for Jerry. NOW it is time for me to be back in the saddle, back in control, and back in the splendid dance that riding is. And here we all are, catching our breaths, in our incredible classroom, survivors and good students, that's me waving hi over on the left. For the very clever, can you spot the 3 mules? 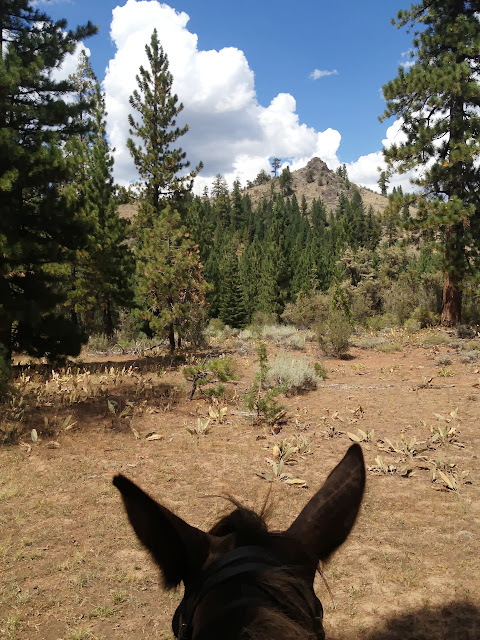 Next we went for a trail ride and a view of Rabbit Mountain. 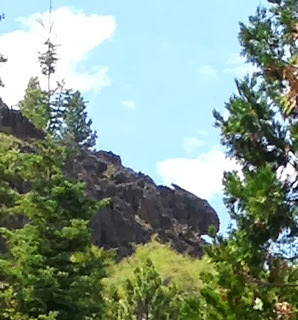 It is way up on the horizon in the photo on the left, and on the right above is an enlargement of the rock outcropping that looks like a rabbit looking to the right with his ears laying back against his head. Or maybe it looks like an angry mule pinning his ears? Then slowly we worked our way back down through the forest, dappled light falling around us, everyone feeling pretty good that 14 animals and their riders from all over the state were getting acquainted and were all meeting with common intent, to learn and improve our riding, and experience the wonders of nature. And I am happy to say that after a full year away from riding and a lot of angst, surgery, physical therapy and rehabilitation, I am back in the saddle and back in my equestrian path. I am deeply grateful to Jerry Tindell for making such an experience possible, and to the rest of the students who were unfailingly kind and generous and helped me with tacking up or anything else I was a bit clumsy with. This day was a great start to a fine vacation.